What Gear Are You Using With Your New Nintendo Switch? The Nintendo Switch has been out for a little over a week now, which is ample time to run out of games to buy and start looking for extra accessories. Here are some of these cases, stands and accessories I’ve been using with my new hybrid gaming system. The Hybrid Cover from Power A is one of the first Switch accessories I received, and one of the first to demonstrate the problem with having that USB power port on the bottom of the unit. It’ll stand the Switch up real nice and keep it from getting all scratched, but you won’t be able to charge it without setting it down. The Hybrid Cover is great for playing Switch games with the Joy-Cons detached, providing several different angles, each more likely than the one provided by the Switch’s built-in stand. Playing with the Joy-Cons attached can be problematic, as the Plus and Minus buttons are right up on the screen frame area and can get accidentally activated. The Hybrid Cover also comes with a screen protector and microfiber cloth, which is nice. To be honest, I have not taken the Everywhere Messenger Bag everywhere, so I cannot attest to the appropriateness of its name. Maybe it explodes in the desert? I hope not, but I’ve not been to the desert recently. This is a very nice bag, especially if you want to make sure everyone knows exactly what you are carrying, or if you want to trick people into thinking your bag of live scorpions is a Nintendo Switch. The inside features several different sections for storing games, accessories and the like, plus a special pouch made just to hold the other special pouch made just to hold the Switch. It’s like pouchception up in here. Again, nice bag with some nice features if you don’t mind advertising. I’d almost forgotten what it was like to juggle tiny pieces of plastic that are actually video games. A case is an excellent idea, and Hori’s Game Card Case is an excellent place to store up to 24 of them, once that many are available. Some of us call this the flavor saver case. None of us call it that. Look! It’s even got space for a pair of Micro SD cards. How thoughtful. Very glad I have this around. Hori’s PlayStand is a compact and inexpensive play and charge stand for the Switch, but it’s also very basic. The USB charging cable is fed through a hole in the bottom of the unit, and there’s absolutely nothing holding that Switch in place should you accidentally knock it. It does, however, fold up really nice. 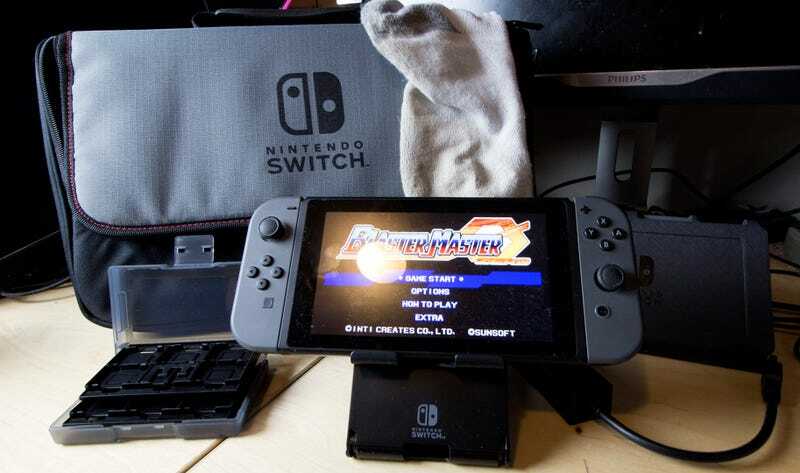 Could you use just about any USB to wired LAN adapter for the Nintendo Switch? Sure, but would they have the Nintendo Switch logo on them? No sir or ma’am, they would not. Unless you painted them. Or got a sticker. Readily available, less expensive options aside, Hori’s Wired Internet LAN Adapter is a nice solution to slow wireless downloads. You should have one of these. Maybe not this one, but one of them. I don’t know why Hori sent me two screen guards. Was I supposed to try the cheaper one, throw it away and then try to more expensive premium one? Is there a bundle I can buy that includes both so I can get the whole experience at one low price? No offense to Hori, but I’m getting one of those fancy glass shields from the internets. Update 3/13/2017, 6:25 PM: As a reader pointed out to me on Twitter, the “premium” screen protector has been getting pinged in Amazon reviews for melting off of the screen. So maybe pass on that one entirely. Somehow this doesn’t seem quite as charming and rustic as when Stephen did it in his initial Switch impressions. Am I doing this wrong? It’s still early days for the Switch, and we’re still waiting for some really cool additional third-party peripherals to hit stores. Is there anything you’re looking forward to? What accessories have you already picked up for your Switch? Tell us in the comments!